I got back late last night from a day at the ABC Child's Expo Trade show in Las Vegas with my friend and fellow blogger Annie Totten owner of Bloume Baby. We had a great time walking the show, trying out new products, and meeting the owners face to face of many of the lines that we use. One of my favorite finds of the day was a new line of nursery furniture & bedding called PetitNest. 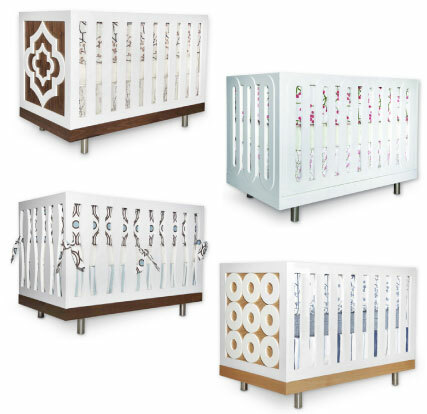 The line is a high-style modern classic collection of quality-made cribs, dressers, gliders and bedding. There is no other style of crib and dresser furniture like this in the market. The furniture pieces evoke a Hollywood Regency flair and become the statement pieces of the room. All of the furniture pieces are available in beech, walnut or white finishes. 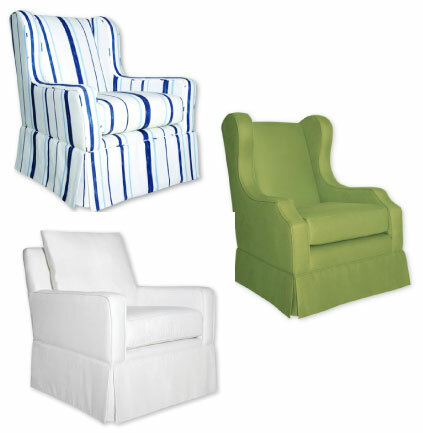 Better yet, the PetitNest collection is eco-friendly and certified by the Sustainable Furnishings Council. The gliders are very comfortable and made of high quality Sunbrella fabrics which are wonderful to use on pieces which will get a lot of wear and tear in a nursery. The Etinne glider was my favorite. As a funny coincidence, when I introduced myself to the designer Lonni Paul (HGTV Design Star finalist), we immediately recognized each other. Just three short years ago, we took the same drafting class at UCLA's Interior Design program and were literally drafting table buddies. Oh how I remembered how we hated drawing peppers! Small world right!? Lonni's partner is none other than the actress Tiffani Thiessen (yes from the cult 90210 and now on White Collar). 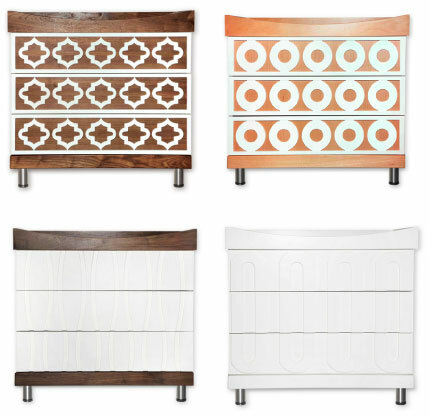 They came together to start this new line after Lonni helped Tiffani design her daughter's nursery. To see more of Tiffani's own nursery designed by Lonni see the article here at Cheap & Chic Nursery. I can't believe I didn't get a chance to go to the Expo!!! I have been drooling over PetitNest since pics of Tiffanni Thiessen's nursery come out in People Magazine. I actually have a post about it ready to go but I was waiting for the launch. Now I can link back to this post as well.